Director Ajoy Varma’s Neerali – also spelt Nieraali in the trailer – is filled to the brim with tension on behalf of its beleaguered protagonists. I could feel fingers of fear closing around my heart as I watched Sunny struggle to figure out a means of escape. The film’s first half is marked by confident writing and execution. Neerali’s weak spot surfaces in the second half. The best survival films inspire admiration with the ingenuity their central characters display while getting themselves out of seemingly hopeless situations. Sunny has not a single brainwave that works. The excitement offered by the circumstances in which he finds himself would have been elevated by multiple levels with at least one stroke of genius or incredible feat of human endurance that gets him out of there, but it never comes. So, there is plenty of reason to be terrified along with Sunny throughout Neerali, but no particular reason to be awe-struck by him in the end. This is particularly disappointing because Saju Thomas’ screenplay is imaginative in the way it builds up curiosity around the manner in which Sunny and Veerappan got stuck in this quagmire and creates suspense around their potential predators. It weaves in interesting insights into human behaviour and some asides on Kerala society, such as the reference to inter-faith romance and the voice of the sermonising Charismatic Christian preacher floating in from the distance. However, the insertion of Sunny’s father (Nassar) into the story seems forced, as does the philosophical significance of the title (which means “octopus”). The early mention of Sunny’s vertigo is later left unexplored. Above all, Neerali fails to come up with an inventive clincher, the sort of wow moment that would have made Sunny a worthwhile hero. Neerali is also afflicted by the same ailment that has dogged most Mohanlal films for too long: the tendency to trivialise women. Women, we are told, are like salt shakers: sometimes you get no love at all out of them and sometimes too much comes pouring out. Like scores of other commercial Indian films, in this one too marital infidelity is portrayed as a charming – and normal – trait in a male character, excusable as long as he always returns to his socially sanctioned companion, his wife. That one of the women Sunny fools around with (Parvatii Nair) is pointedly described as a Bombayite underlines another prejudice evident in some Malayalam films (and in Kerala society): that the urban woman who is an outsider is fair game. This being a Mohanlal film, of course each of the actresses with whom he is shown to have a relationship looks eons younger. The women he has flings with are both played by artistes who are, characteristically, three decades his junior. Usually in the superstar’s films, despite all these problematic areas, his acting shines through. Mohanlal the actor in Neerali though comes bearing a massive distraction. His face seems somewhat frozen and obviously altered, but it is hard for an inexpert eye to be sure whether the reason is excessive under-eye make-up or badly executed prosthetics or inexplicable lighting or some other “enhancing tool” (to borrow a phrase Bollywood’s Anushka Sharma used a few years back when she was lampooned for a glaring lip job). Whatever it is, it subtracts from a great thespian’s performance. Mohanlal being Mohanlal, when his eyes do speak at Sunny’s lowest point, the world stands still in Neerali. For the most part though, his performance here is overshadowed by Venjaramoodu although the latter is given far less to do by the script. While the maudlin song in the end needlessly stretches Neerali, the rest are placed such that they enhance rather than obstruct the narrative. A couple of shots inside the car while it is on the move appear to have been taken within a studio and look tacky, but for the most part, Santosh Thundiyil’s clever camerawork contributes to the ominous air of the film and in establishing the magnificent vastness of the landscape on which these two minuscule beings are stuck. 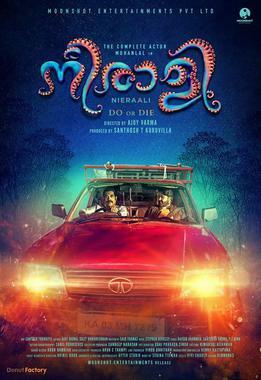 This and some sure-footed direction are the reasons why Neerali, for all its flaws, is gripping through every second that it remains with Sunny and Veerappan in and around that ill-fated vehicle.